In Warlords of Draenor, this item will be added to the new Toy Box feature and no longer take up space in a character's inventory. You will be able to "use" the item straight from the Toy Box interface. The Toy Box will be account-wide and therefore so will this item. 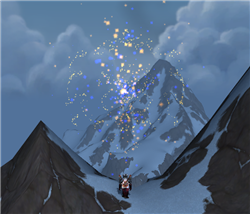 It seems that of the most recent beta build, learning and adding Everlasting Alliance Firework to the Toy Box will also add Everlasting Horde Firework to the Toy Box. EDIT: The toy is now available for everyone! Players can now buy it for 25 x Coin of Ancestry while Lunar Festival is active.